Would you like to cover the cost of your initial exam and x-rays? Performance Spine & Sport has a partnership with the Northern Illinois Food Bank so if you bring in just two non-perishable items to your first visit those costs are waived. From the moment you enter the office until the time you walk out our door, your first visit should be both educational and reassuring. Our friendly staff will greet you and help you with the necessary paperwork, which should only take 5-10 minutes of your time. The initial paperwork is important because it provides us with general information about yourself and your condition, so we know how to best treat your particular case. Please bring your insurance information to your first appointment, if you have it, so that we can complete all the necessary paperwork. 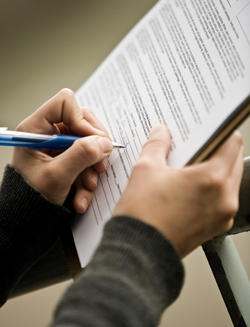 To fill out your paperwork in the convenience of your own home please click here. Soon after you have filled out the initial paperwork, you will meet with Dr. Jonathan Rinn for your initial consultation. He will also complete a thorough examination, including x-rays, if necessary. Plan on reserving around 30-40 minutes for your first visit. At Performance Spine & Sport, We Listen! We operate on a strict level of confidentiality, so we want you to feel comfortable discussing any health related issues or goals you may have with us. We are here to help you – that is our primary objective. After your first appointment the doctor will then take the necessary time to review your paperwork, exam and x-rays so that he can provide you with a proper diagnoses and care plan on your second visit.